If you are looking for the fastest production super bike, the X18-R Nitro ( Race Edition ) is it! Powered by a newly retuned and tweaked Honda®-Based 110cc 4-Stroke Engine, this super bike can reach stratospheric RPMs in only a few ticks. 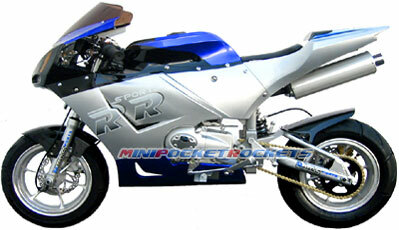 The needle sweeps the 70+ mph top speed quicker than any other super pocket bike available. A Race-calibrated carburetor and max air velocity intake system ensures that the X18-R will be the dominant force to be reckoned with wherever you go. The X18-R's frame and sub-frame was designed from scratch using the latest CAD systems. It's slippery profile produces one of the lowest drag for the best in aerodynamics and stability. Partner that with the Race-prepped suspension system (infinitely adjustable) and you get one of the most stable super pocket bikes in the high-speed sweepers and in the tightest of corners. Front and rear hydraulic brakes and Racing calipers stop the X18-R in record braking distances. Grab the left hand lever to feel the difference a Racing clutch makes. Mated to a 4-speed Sequential Manual Gearbox (gear selection digitally displayed on dash), upshifts and downshifts happen in mere milliseconds. Acceleration is strong in any gear because of the X18-R's revised torque curve, which provides maximum power even at lower RPMs. The large diameter free-flow exhaust screams a melodious note at wide-open throttle while staying relatively quiet at idle and low revs. Every option has been included with the X18-R. A full array of gauges on the backlit dash relay information to the rider including speed, current voltage level, warning lights and an LCD digital display of the current gear selection. The electric start button, brake lever, horn and other essential controls are ergonomically located at your fingertips. All ACC items are fuse protected, key activated (anti-theft) and charged via the ZR motorcycle alternator. The non-slip leatherette seat and fully adjustable controls (handlebars, brakes, levers, suspension, tire pressure, etc.) guarantees a customized fit for any rider. The X18-R (Race Edition) Nitro Super Bike comes fully assembled and ready to ride. All upgrades and performance parts are OEM factory installed and tuned for maximum gains and reliability. With numerous Race-prepared modifications performed to the engine and powertrain, the X18-R outpowers all other super bikes at the strip! Please note: The X18-R super pocket bike comes pre-installed with a speed governor to help regulate top speed so it is safe for less experienced riders. To permanently remove the governor, the owner or rider needs to have some experience with basic hand tools such as a screwdriver. Our technical support team can assist you through the process over the telephone, if needed. Step-by-step instructions will be provided for this simple procedure. Included Free with 4-Stroke Super Bike: Individual Keys (2), Tools (sockets, screwdrivers, allen wrenches), Tool Case, Spare Fuses, Owner's Manual / Certificate and our free extended warranty.